Hillary the hippopotamus lived with her family in a lovely area in the forest. There were lots of trees and a big beautiful pool. They were all very happy and healthy. Everyone had plenty of food to eat and Hillary had plenty of friends. Every day Hillary went swimming with her friends, and they played in the pool for hours. One day while Hillary and her friends were playing, they saw a very strange animal drinking water at the pool. None of them had never seen an elephant before, but to Hillary it was the most beautiful animal she had ever seen. She couldn't stop staring at his beautiful big ears and his long trunk. Harry the elephant was the most majestic and gracious animal she had ever seen. When Harry left, Hillary quickly followed him as far as she could, and longingly watched as he walked slowly through the trees back to where he came from. She caught a last glimpse of his short tail before he disappeared. Hillary was in love. She couldn't stop thinking about Harry. Every day she sat for hours watching the spot where she first saw him first. She hoped that he would just appear again out of nowhere, to come and sweep her off her feet. Hillary was miserable. She couldn't eat and she couldn't sleep. She didn't have any joy left in the world. Her parents became very worried about her and send her to see Doctor Crocodile. He was the oldest animal in the area, and he knew a lot about everything. Hillary told Doctor Crocodile everything about Harry the elephant and he quickly figured out that there was nothing physically wrong with Hillary. All she needed was to find love then she would get back to normal. Hillary's father lined up all the young viable male hippopotamuses, and they visited Hillary one by one. There were a few that Hillary liked but she couldn't get her mind off Harry the elephant. 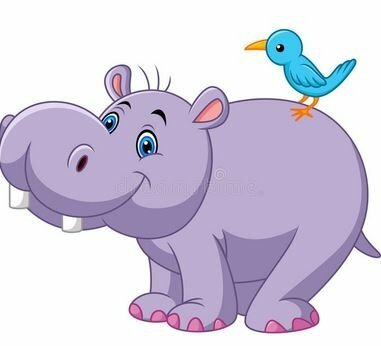 Hillary became friends with Howard the hippo. Howard fell in love instantly. He did everything for Hillary and Howard went out of his way to make life as easy for Hillary as possible. He brought her food, and he brought her flowers. It went on for months, but Hillary's eyes still wandered off to the spot where she saw Harry first. One day Howard has had enough. He packed up his things and set out to go and find Harry. Hillary started to miss Howard terribly. She missed their talks, and she missed the food and the flowers that he brought her every day. It took Howard a few weeks, but eventually he tracked down Harry. Howard told Harry about the tragic set of events, and he asked him to help him win Hillary over. After all, Hippo's and Elephant's don't really belong together. Harry agreed, and went back with Howard to go and find Hillary. Hillary sat in her usual spot waiting for Howard to come back, but when Howard and Harry walked through the trees, she didn't even notice Harry. The only one she wanted to see was Howard. She couldn't believe how silly she was. She was so fixated on the idea of love, that she didn't realize that the love of her life was already there right under her nose. In the end, Harry, Hillary and Howard became great friends, and they all played together when Harry and his family came to drink water down at the pool.